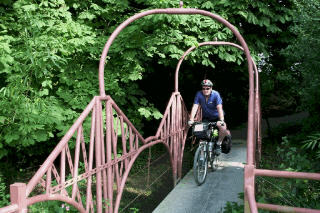 Approx 60 mile circular linking the National byway and the White Rose 65 Sustrans route. 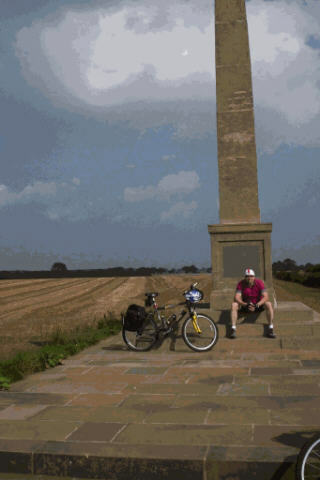 And returning through some quiet country lanes, passing the Historic Marston Moor battle site, we cycled it over two and half leisurely days but it could be done on a full day excursion. We started at my home in Marton le Moor, but I suggest the Ride starts at Karbitz Cycle Shop Boroughbridge (Ran by the helpful Tony Howard). If you have arrived by car there is ample parking in Boroughbridge. Plus starting at the Cycle shop you can purchase any last minute spares plus make any last minute adjustments which tend to be needed after your cycle has been rumbling around in the back or at the back of a car for a few miles well that’s my experience. The Route – Boroughbridge pick up the National By way signs at the top of the Market place and cycle out towards Aldborough the route is signed with brown signs at every junction. Follow the brown signs left Aldwark village then Right towards Alne Crossroads where you join Route 65 the Blue signs all the way to York. And The City centre arriving along by the river. In York City Centre follow the Blue Cycle Signs through the city picking up Acomb, from Acomb cycle out towards Askham Bryan and Askham Richard. Crossing the York by pass is easy with a cycle friendly lane. Tockwith turn right approx a mile out Tockwith to Cattal over the River Nidd and the narrow bridge turn right towards Whixley. Cycle up over the railways lines to the A 59 crossing direct across up the only bank of the ride to Whixley village careful in Whixley as there are several roads meeting basically ride straight through and take the right lane past the Cricket field. Then down hill caution at the main road Stop sign!!!! Then downhill to Thorpe Underwood cycling back towards Great Ouse burn where you pick up the National byway once again back to Boroughbridge. I suggest you use the Yorkshire National Byway Map plus the Sustrans White Rose Route. You can use the Os maps for this area but you will need 3 as the area covers and is spread on the 3 corners of 3 OS Maps. Well that’s the route and here is our adventure. A quick couple of phone calls the week before Graeme was on holiday and had a couple of free days did I fancy a ride out, I suggested York as I had been in Chesterfield for the weekend. 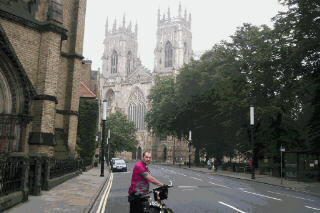 So we decided on York and a couple of map checks I selected the route. I left Chesterfield at 730am it was a quick cheerio to Jill, I was home for 930am time to sort out my borrowed bike, as I managed to put a spoke through the rim of my Claud Butler Friday of the week before. I kitted out my neighbour’s bike for a Two day tour. And it rode well never missed a beat. Now regular readers of my logs will be saying that makes a change. I was kitted up and Graeme arrived at 11 am by 12 noon we were all kitted up and bikes ready to roll. Downhill to Boroughbridge, to pick up the national by way. As we cycled through Boroughbridge Tony was outside the bike shop, I shouted hello all he noticed was the different bike I was riding and as we cycled up the street he was shouting What’s that you riding? I l tell you later I shouted back and we sped out the town only to hit our first diversion, the flat road to Aldborough was dug up and we had to put in a short uphill diversion through Aldborough village, typical. 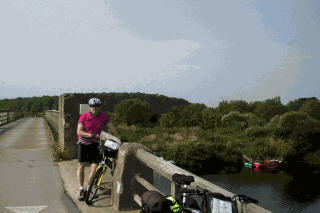 Through we cycled through the pleasant traffic lanes to Ouseburn and down to the Toll bridge at Aldwark. Chatted to the Tool man a couple of minutes and stopped for a photo. Then followed the byway into Aldwark village it was funny as we cycled through there was an Aqua Cool delivery lorry with squeaking springs in and around the same lanes and seemed every corner we turned we could here him before we saw him, well we thought it was funny. Down to Alne crossroads and onto Route 65, it was wonderful bikes running well traffic free roads and the sun shining and no wind. Down to Linton where we called into Linton Locks hopefully for a drink, unfortunately the pub was closed, the Popped his head through the window and asked us if we were wanting to camp, when I said no he disappeared again. We had an uneventful ride into York, however a strange thing happened on the Off road section on Clifton Ings as we crossed one of the cattle grids a chinaman on a bike was cycling the opposite direction, de je vu as when we had cycled that same spot in 2000 a chinaman passed us on a bike exactly in the same place. Spooky. 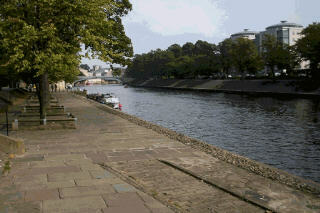 Into York along by the river a great feeling and it was only 3 30pm. Found the digs just up from the river another surprise the Landlord of the B and B Briar lea opened the door. Its Mal Brass isn’t it? Shock the guy then remembered me from my cricketing playing days in York 30 years ago. Amazing we had a good old chin wag about cricket a long long time ago. Nigel looked after us well too, nice digs good breakfast and a good clean room. Would have no hesitation in recommending Nigel’s B and B the Briar lea. We will mention it on the website. 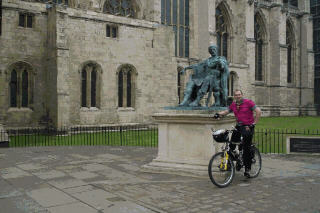 Anyway shower shave and quick change and grame and I wandered into York to be tourists and enjoy a few beers. A great meal in Harker’s too. Plus we savoured the atmosphere and enjoyed sitting outside the Kings Arms by the river drinking Sam Smith’s at £1 40p a pint. Interjecting the night with lots of text messages backwards and forwards to Chesterfield. The digs and after a quick cuppa we crashed out, not before I d put tea bags in Graeme’s panniers, are well it was late and I had had a few. A few trinkets purchased and we headed off on the return journey, pretty uneventful but lovely weather again and we cycled out through Acomb, picked up the quiet lanes the flat lanes too, via Askham Richard and Long Marston and passed the Marston Moor Battlefield a Civil War battle. We stopped to read up on the history. Onto Tockwith stopped for a welcome drink and then we crossed the River Nidd at Cattal traffic free country lanes till we got to Cattal Narrow bridge and we encountered a Bus turning right and cars everywhere amazing. Up to Whixley and the only real hill of the ride which rises straight after crossing the A59. Then it was downhill to Thorpe Underwood all the time hot and quiet country lanes and back to join the National Byway to retrace our steps into Boroughbridge and the end of the ride if you follow my route. 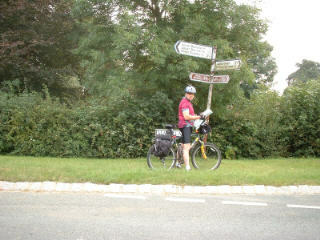 However we cycled via Skelton on Ure and then back to Marton le Moor. Remembering the last time we had cycled that road we had cycled up from Bath. During the End to End ride. We should do it again and make sure Colin comes for these mini breaks, the multidaymen ride out.